Marrakech, is without doubt one of the great cities of Africa as well as the gateway to the desert. It is a city of exotic beauty, with palm-lined streets and red-earth walls, surrounding a huge Medina of flat-roofed houses. Labyrinthine alleyways, secluded palaces, museums, mosques and markets just add to the atmosphere. The souk is famous for the dazzling variety of spices and Berber carpets as well as the fine quality of leather work. History The Almoravids, from the Western Sahara, founded Marrakech in the 11th century. 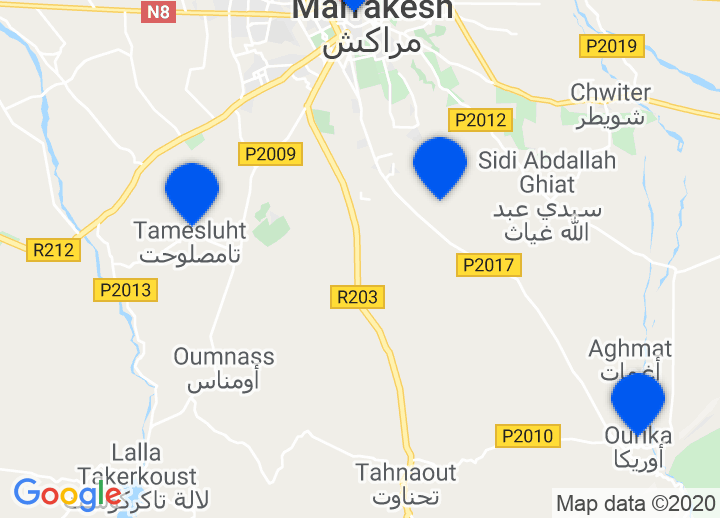 Choose from our romantic and charming riads and hotels and Riads in Marrakech and accommodation by clicking on the map or list on the right. These will highlight a wide selection of Medina accommodation, including romantic hotels, riads in Marrakech, dars Marrakech, bed & breakfasts, amongst others. Whatever your taste, we’ll help you find that perfect getaway. There's a lot to see in Marrakech! You can visit the palace Bahia, the Saadian tombs or the Koran school Medersa Ben Joussef. The Souks and the Musée de Marrakech are also worth visiting. Jardin Majorelle, a botanic garden in the centre, has colourful houses and a wonderful atmosphere. If your feet are hurting, you just go for a historic carriage ride through the city! In the surroundings, there are guided trekking tours, helicopter flights and even trips to the desert. The Marrocan cuisine offers you a lot of different dishes! You can try a delicious Tajine (stew with or without meat), Couscous or Brochette (meat skewer). Furthermore, there is a special soup with lentils, called Harira, and the typical salty cake Patilla. Obviously, you should try a good cup of a mint tea! A little hint: Marrakech offers a lot of different cooking courses!